. . . and our new fave . . .
Other X-BLs are so named because they use a specific context for learning, such as a particular place or type of activity. They may contain projects within them, or have some of the 8 Essential Elements, but not necessarily. For example, within a community- or service-based learning experience, students may plan and conduct a project that improves their local community or helps the people in it, but they may also do other activities that are not part of a project. 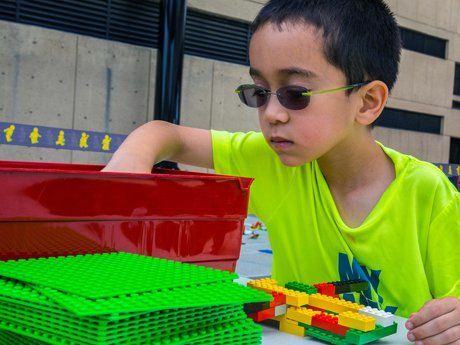 Conversely, students may learn content and skills via a game-based or work-based program that does not involve anything like what we would call a PBL-style project. Because they have the same acronym, we get a lot of questions about the similarities and differences between the two PBLs. We even had questions ourselves -- some years ago we created units for high school economics and government that we called "problem-based." But we later changed the name to "Project-Based Economics" and "Project-Based Government" to eliminate confusion about which PBL it was. We decided to call problem-based learning a subset of project-based learning -- that is, one of the ways a teacher could frame a project is "to solve a problem." But problem-BL does have its own history and set of typically-followed procedures, which are more formally observed than in other types of projects. The use of case studies and simulations as "problems" dates back to medical schools in the 1960s, and problem-BL is still more often seen in the post-secondary world than in K-12, where project-BL is more common. Teachers at some K-12 schools that use project-BL as a primary instructional method, such as the New Technology Network and Envision Schools, have begun saying that they use problem-BL for math. Especially at the secondary level, teaching math primarily through multi-disciplinary projects has proved challenging. (Not that occasional multi-disciplinary projects including math are a bad idea!) By using problem-BL, these teachers feel they can design single-subject math projects -- aka "problems" -- that effectively teach more math content by being more limited in scope than many typical project-BL units. Tackling a "problem," for example, may not involve as much independent student inquiry, nor the creation of a complex product for presentation to a public audience. How Does This Tale of Two PBLs End? One could argue that completing any type of project involves solving a problem. If students are investigating an issue -- say, immigration policy -- the problem is deciding where they stand on it and how to communicate their views to a particular audience in a video. Or if students are building a new play structure for a playground, the problem is how to build it properly, given the users' wants and needs and the various constraints of safe, approved construction. Or even if they're writing stories for a book to be published about the Driving Question "How do we grow up? ", the problem is how to express a unique, rich answer to the question. So the semantics aren't worth worrying about, at least not for very long. The two PBLs are really two sides of the same coin. What type of PBL you decide to call your, er . . . extended learning experience just depends on how you frame it. The bottom line is the same: both PBLs can powerfully engage and effectively teach your students!